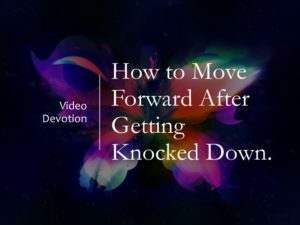 When you get knocked down, when you find yourself in the pit, how do you get back up? How do you move forward when you want to change? Maybe it’s time to make some serious changes. Maybe it’s time to let finally get your finances in order. Maybe it’s time to let go of the addiction. Maybe it’s time to finally move past the shame and the guilt. We’ll see, I’ve heard this before. Sometimes the voices are from people close to us. Sometimes the voices come from our own head. When you begin to step forward and the voices come, you have to push them to the side. It is in that very moment that you have to stop and remember the all spiritual blessings God has given to you, because what Jesus says about you is more important than what anybody else says about you!